Just Don’t Ask got Chipping Norton trainer Charlie Longsdon off the mark in 2019 at Wetherby. The seven-year-old won the Racing TV Novices’ Chase in the hands of Brian Hughes. But it was a late decision to head north for the yard. The Hull Farm handler explained: “It is always good to get a winner and the first one of the year is great to get the ball rolling, as Just Don’t Ask did at Wetherby. “It was very much a last minute decision to go there with doubts over the ground, however with little rain forecast over the next few weeks and JDA in fantastic form at home we thought we would take our chance. “He travelled and jumped well and gave Brian [Hughes] a great feel despite being a bit keen early doors. Trainers with eyes on the Cheltenham Festival will be keen to see some of their runners at Festival Trials Day later this month. The seven-race programme on Saturday, January 26 offers a total of £354,000 in prize money. 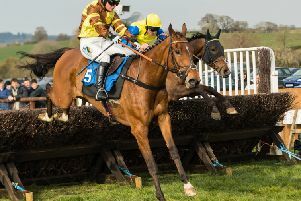 It features the £100,000 Grade 2 BetBright Trial Cotswold Chase, staged over three miles and a furlong and a leading trial for the Grade 1 Magners Cheltenham Gold Cup. Festival Trial Day also has three more Grade Two races, including the £60,000 galliardhomes.com Cleeve Hurdle over three miles, which often provides valuable pointers to the Grade 1 Sun Racing Stayers’ Hurdle at the Festival. First race of the seven-race programme at Cheltenham on Festival Trials Day is 12.40pm and gates open at 10.30am. Tickets in advance can be purchased via www.cheltenham.co.uk. Accompanied children aged 17 and under attend for free, and there is also plenty of free official car parking at the Prestbury Park racecourse.